Spell of Significant, Disruptive Snow forecast for southern areas tomorrow! A dry day for most tomorrow with variable sunshine and cold conditions however in the south west of England a mixture of rain and hill snow will arrive during the afternoon. Some of this will fall as heavy snow over Dartmoor, Exmoor and high ground in the SW however some slight accumulations are possible to lower levels in Devon, Somerset and Wiltshire. A mixture of rain, sleet and snow will also affect central and southern Ireland with accumulations ripe on hills in the South through the afternoon. By tea time it’s possible that snow could become quite heavy for the hills of southern Ireland, much of Wales (inland and up hills), and to lower levels for southern counties of England, firstly places like Wiltshire, Hampshire and Gloustershire, Herefordshire could be affected by 2-5cms with more in places by say tea time to 7pm before the snow transfers eastwards towards the home counties, into Greater London, and parts of the central and southern Midlands by say 10pm. Widely across the central and southern Midlands 1-3cm is possible with up to 5cm on hills. 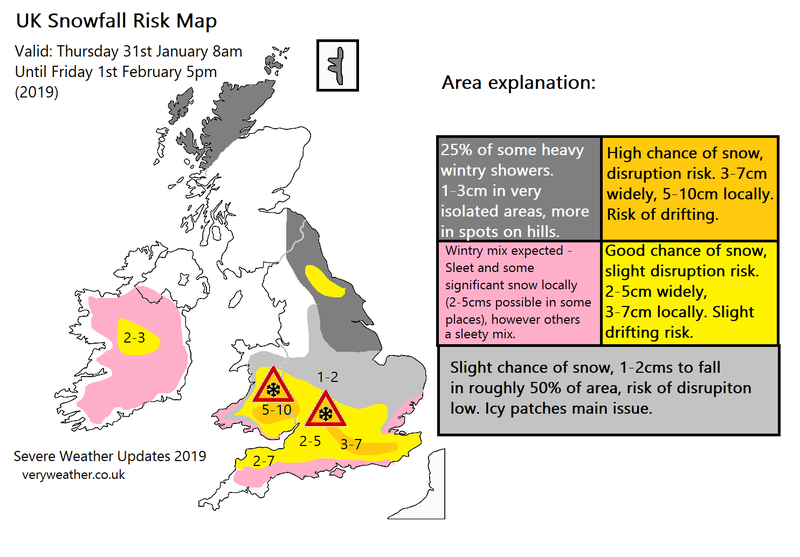 The most intense accumulations are likely on southern coastal counties of England (inland risk is higher), anywhere from Devon to Kent including Surrey, Northern Hampshire into Berkshire, Oxfordshire, Wiltshire, with 2-5cms likely widely here with up to 10cm in a few spots, perhaps 12 on hills. On the coast accumulations of snow will be patchy. For parts of Wales, by midnight Friday some areas could see 5-10cms on hills, with 2-7cms more typical in the Welsh Valleys. Overnight into Friday snow will lose it’s intensity and become lighter but still affecting parts of the Midlands, perhaps parts of East Anglia, giving scattered accumulations of 0.5 to 2cm into Friday. However by Friday our focus shifts to North East England, South East Scotland for some isolated heavy snow showers, giving 2-10cm in places, these snow showers will be quite narrow in nature and isolated so predicting their exact location is almost impossible but they are likely in places in the North East on Friday, in a section from the North York Moors to the eastern Southern Uplands of Scotland they are possible. This entry was posted in UK Ireland, Uncategorized on January 30, 2019 by admin8. This map is not a definite forecast of snow, but highlights which areas are most likely to see it through tomorrow. The air tomorrow will not be desperately cold, so unlike during for example “the beast from the east” during which the air was well below freezing for all, temperatures tomorrow will be hovering at around 1 or 2C, so some places will see a mixture of rain and sleet, whilst others not so far away will see moderate snow, so it’s a fairly complicated and tricky forecast. Early tomorrow afternoon from around 12pm to 3pm we can expect a mixture of rain, sleet and moderate snow across northern parts of England, Mid and North Wales and the North West Midlands. Above 100m a transition from rain to moderate snow is likely (75-90%), however below 100m elevation the chance of seeing the rain eventually transition to snow is slightly lower (only 50%), so this is a tricky forecast as explained. 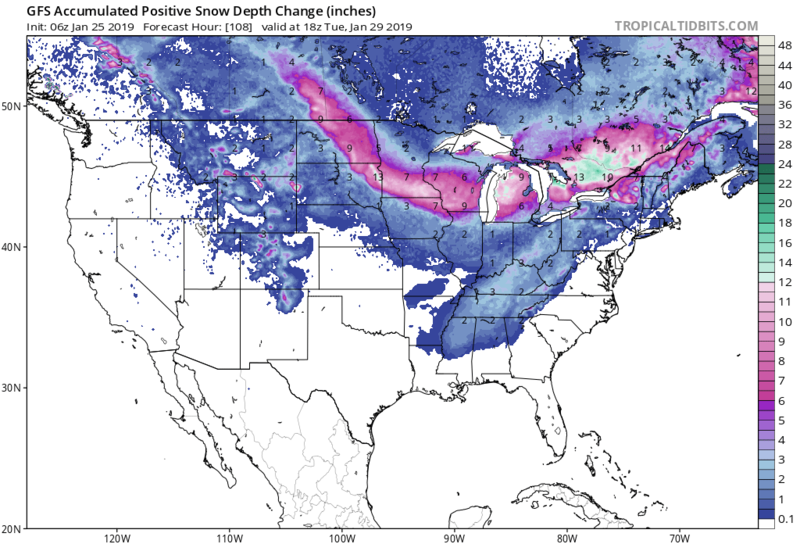 Areas that do see a progression to snow, which is higher for inland and elevated towns and cities like: Stoke on trent, Buxton, Sheffield, Birmingham, Coventry, Leeds, and slightly lower for more coastal, low elevation areas: Manchester, Blackpool & Liverpool. Later into the evening the snow and sleet mix will reach the East Midlands and Lincolnshire, again giving a mixture of rain sleet and snow with the bulk of the snow to hills, but there will be a touch to lower levels (in places), and where it does fall a few centimeters of snow will accumulate. 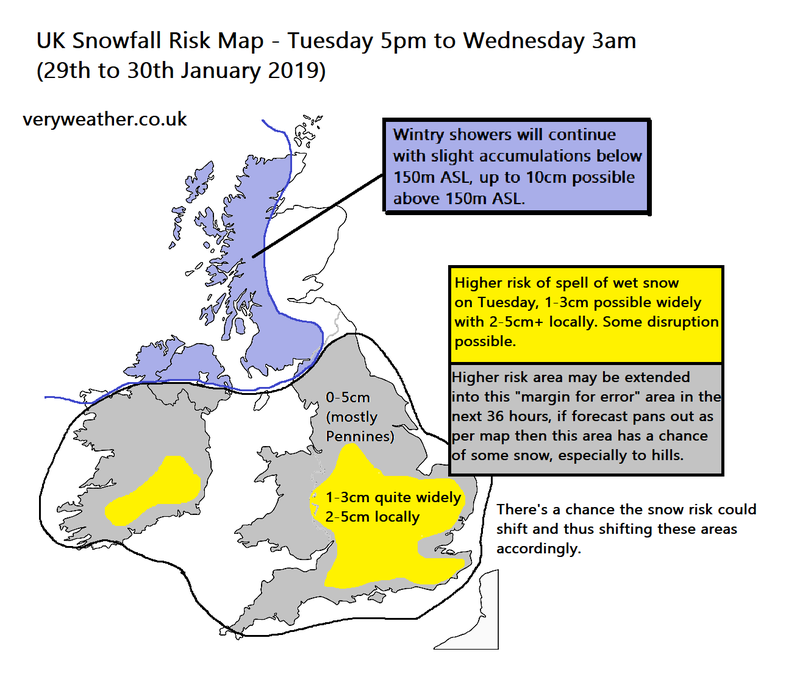 Once we head into the proper evening hours of tomorrow, from around 7pm onwards towards midnight, we start to see that risk of snow further south east, into the east Midlands, Lincolnshire, and then towards South East England. Below 100 metres the risk of snow is moderate (around a 50% chance), but where it does fall there is the potential for 2-5cm of snow here with more over the Chilterns and North Downs. Eventually the messy mix will clear into the early hours of Wednesday leaving a legacy of cold, dry and frosty weather. A very cold night is predicted with minimas of -3 of -4C for some central areas of England, Scotland and eastern Wales, so ice will be an issue to start Wednesday. Later in the week there’s the potential for another snow event on Thursday across similar areas to those affected tomorrow. Again, there’s significant uncertainty with regards to this however where snow does fall it could be quite disruptive. Stay tuned to the forecasts! And please send in your UK Snow Reports on our facebook / twitter social media outlets tomorrow. This entry was posted in UK Ireland on January 28, 2019 by admin8. 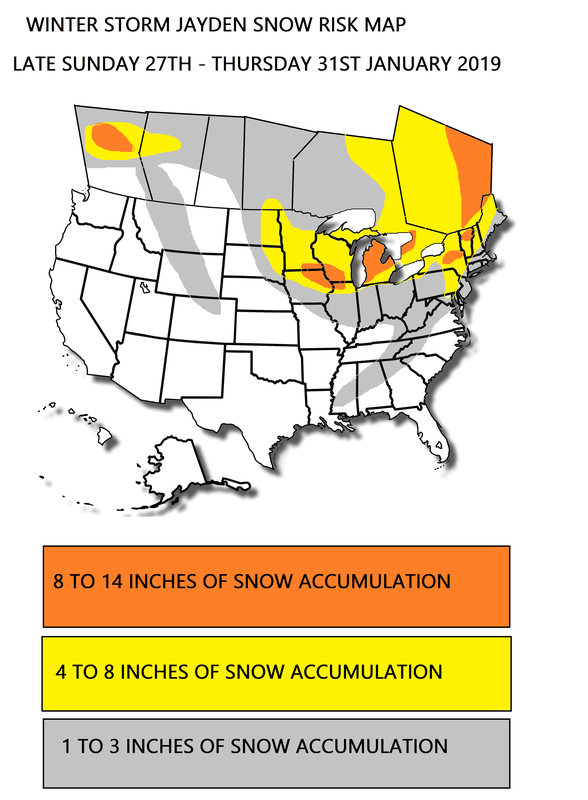 For more information on the day to day changes in the snow-risk for various regions, please use our 5 day regional snow forecast. 5 Day Regional Snow Forecast. 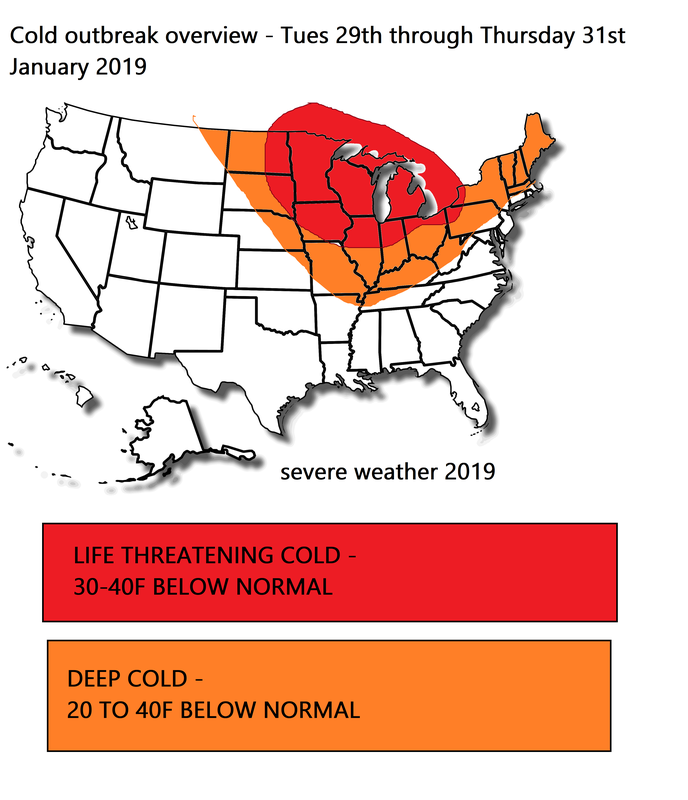 Whilst much of the Mid West, Great Lakes region of the U.S. is about to be plunged into a record-breaking polar vortex winter freeze, the outlook is more modest here in the UK for the next few days with temperatures hovering at or perhaps slightly colder than average. Although most inland areas will remain dry during tonight and into tomorrow with some ice forming in places, on the eastern coast of England we’ll keep some heavy showers, some of which may turn wintry overnight. 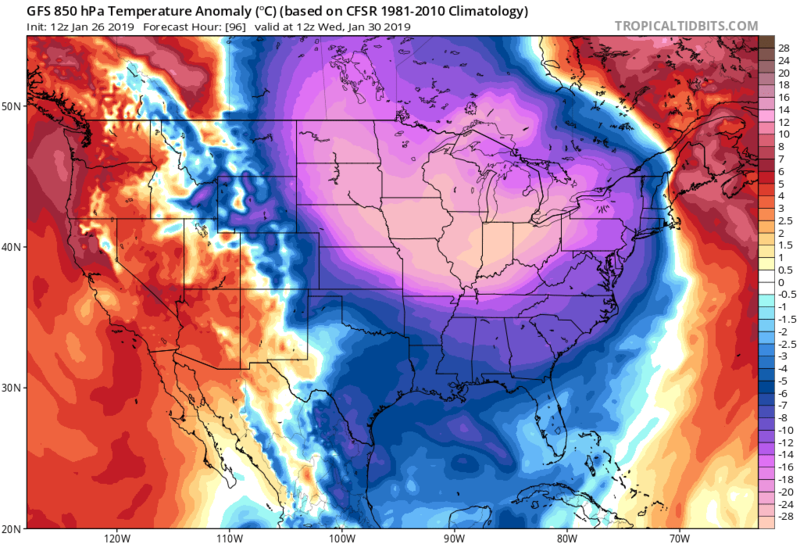 This leads the way into a more settled Monday with a good deal of sunshine for inland areas, albeit rather cold. Winds will be lighter in comparison to today as well. Up in Western Scotland and Northern Ireland some wintry showers will form through Monday, giving accumulations of snow above 200 metres. During Monday night wintry showers may sink into North West England, giving the Pennines a risk of a sprinkling. At the same time we continue to feed in showers to Western Scotland and Northern Ireland. Elsewhere, mainly dry and clear into Monday night with a frost in places. Tuesday is when things get interesting. Most of us start the day cold and clear with a frost, though we’ll keep some scattered sleet and snow showers in the north west. Through the morning Ireland will be affected by outbreaks of rain, which may turn to snow later on Tuesday for central and northern parts of Ireland. Through Tuesday we’ll keep that pattern of wintry showers in Western Scotland and Northern Ireland with the snow line falling closer to sea level, eastern Scotland dry. It’s through England and Wales where things could get interesting later on Tuesday, an area of precipitation associated with a low pressure system is expected to spin up into the British Isles on Tuesday, which is producing a risk of snow for inland areas. At the moment the risk is highest through the Midlands, especially the East Midlands, and into East Anglia by tea time Tuesday. However some more northern areas like Northern England, could also come into the risk zone. Later on Tuesday there’s a chance that more south eastern parts of England could be impacted by a little snow. 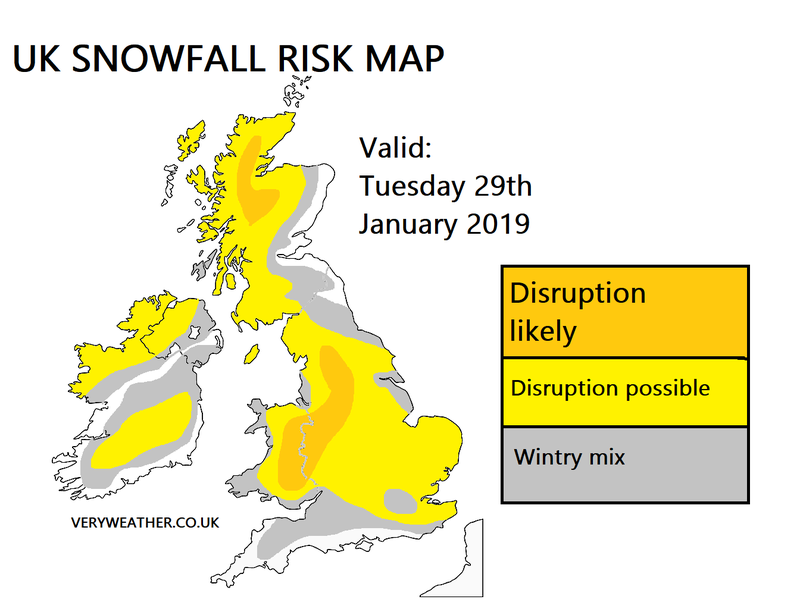 This is not expected to be a major snow event, and the “snow-zone” could shift, however we’ve outlined in our risk map the areas highest at risk of some snow on Tuesday evening. Once again this could change a little. We will update you tomorrow evening so make sure you check back on our page nearer the time to find out exactly where this snow will be, as in 24 hours we will have a good indication of where things will go. 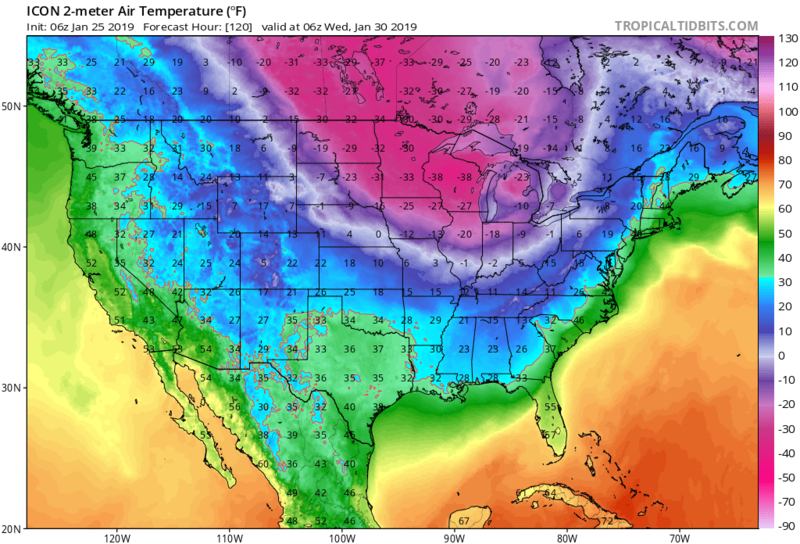 Thereafter things could turn somewhat calmer into Wednesday, albeit a little colder with another widespread, in places hard frost to start Wednesday, with a risk of icy patches to start the day. Another little low could spin up on Thursday evening, which could once again enhance the snow potential, this time perhaps for more central and northern areas, however details regarding this are quite uncertain. This entry was posted in UK Ireland on January 27, 2019 by admin8. Shock horror as up to 1 MILLIMETER of snow fell on higher towns and villages. To lower ground, up to a deadly millimeter fell. Gritters have been overturned and cars abandoned after the shock snow flurry swept over the UK last night. Many residents fear travel disruption as the trains have been affected badly by this. Manager at rail UK says “We have sadly had to suspend a number of services in and out of London, Birmingham and Manchester today for health and safety reasons.”. Manager at UK Airport central says “Our Airports are not designed to cope with this amount of snow, only snow that is not visible to the naked eye”. The prime minister has issued an urgent announcement advising residents to stay indoors. Shelves have been “wiped clean” in many areas after the first few flakes fell yesterday. Residents are URGED to stay indoors and heed warnings where and when possible. The Weather Office has issued a warning for | YELLLOW | SNOW | advising residents not to go near it if possible. It may be contaminated. Residents of Scotland however have received 3 feet of snow and are reportedly driving around as normal, which caused many UK citizens to faint upon viewing the footage, and residents are also advised that this is a joke post! This entry was posted in UK & Ireland on January 24, 2019 by admin8.